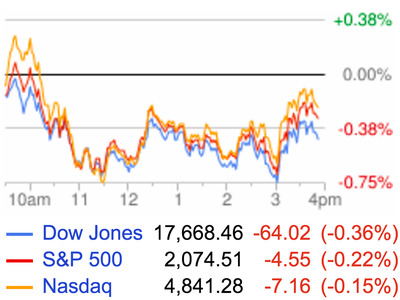 Stocks in the US were lower on Tuesday ahead of Wednesday’s big Federal Reserve announcement, though stocks stateside were less than the sell-off seen overseas as concerns over a potential Brexit continue to weigh on markets. The May report on retail sales showed sales were up 0.5% over the prior month, more than the 0.3% increase that was expected while sales for the retail “control” group — which is what goes into the GDP calculation — were up 0.4% over the prior month. A couple of notable sections here were the divided between non-store retailers (the subgroup that captures online sales) and department store sales. In May, nonstore retailers saw sales rise 1.3% over the prior month while department store sales were down 0.9%. 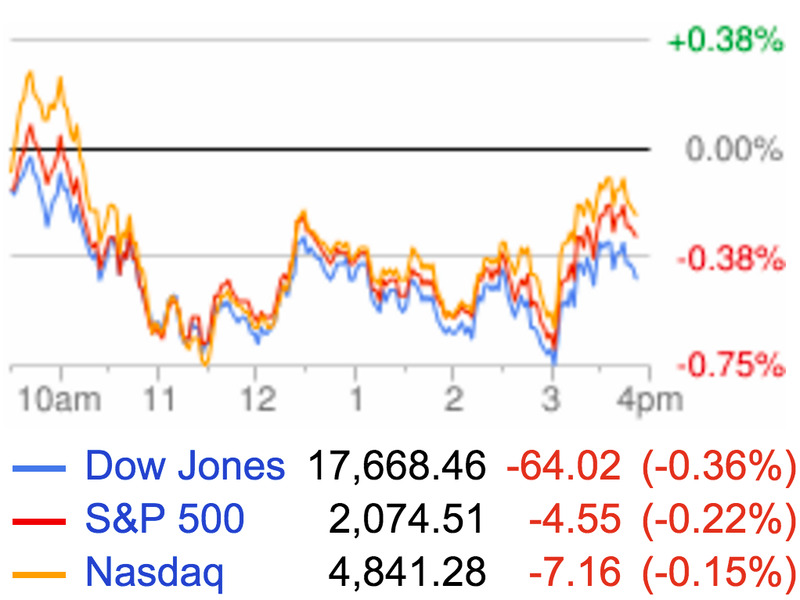 Expect these diverging fortunes to continue. The report also gave us some slightly discouraging news out of the home goods space (including building materials, furniture, and garden supplies) with this subgroup seeing the biggest three-month drop since 2012, according to Bloomberg’s Matt Boesler. Uber is raising more money. Congrats! The ride-sharing company is reportedly set to tap the leveraged loan market for up to $2 billion in funding, according to The Wall Street Journal, a move that could bring the company’s total fundraising to $15 billion. Uber now has a valuation of $68 billion. These are big numbers. Couple of interesting things here. As Bloomberg’s Julie Verhage reported back in January, the company wasn’t disclosing full financials (or, more specifically, Morgan Stanley wasn’t disclosing Uber’s full financials) to prospective equity investors in a previous fundraising round. When you’re offering equity and people want to throw money at you, well, obviously Uber was given more leeway in terms of disclosure. But owning stock in a company is (though this might not be a sound investment strategy!) something that can be undertaken with less-than-solid information about a company’s financial condition right now or even its projected near-term standing. If you’re a long-term stockholder, you’re hoping the business grows and that you will share in the eventual profits. Again, all this in theory, lots of things depend, etc. etc. Also this is not investing advice. Credit investors, however, are a more discerning bunch. Credit investors, unlike equity investors, think mostly about what can go wrong with a company since not only are they owed regular coupon payments but then all of their principal back at the end. Presumably Uber is going to need to disclose more of its financial condition as part of this offering. Which is exciting, given that people don’t really know a whole lot about the company. Two other interesting things to think about here: is Uber raising this money because investors are throwing themselves at the company, almost begging them to take the capital and Uber is being smart and saying, “Oh and the terms are great? Yep, we’ll take it!”; or, is Uber in more dire financial condition than we think and raising money to meet growing burn rates? We don’t really know. These outcomes are quite different. Also neither may be true. But it is a fascinating company to think about. People are worried about stuff. As a result, lots of investors are in cash. According to Bank of America Merrill Lynch’s latest fund manager survey, the amount of cash being held by those surveyed by the bank is at the highest level in about 15 years (since November 2001). Recall that at that time were in a post-tech bubble recession and reeling from the events of September 11. Quite a different time. Now, we have markets concerned about the UK voting to leave the European Union, China slowing more than official data say, the Federal Reserve about to raise interest rates and/or make a policy mistake, all while labour is beginning to eat into capital’s profits in the US. And stocks and bonds are at generational highs. Speaking of labour over capital, Luke Kawa over at Bloomberg highlighted the latest wage tracker from the Atlanta Fed which shows, definitively, that wages are going up. You know, if you believe that sort of thing. The Atlanta Fed’s tracker follows median worker pay in the US, which has risen 3.5% year-over-year as of May. Note that the 2.5% year-on-year increase in the May jobs report brought average hourly earning gains for 2016 to a tracking rate of 3.2%, so not far off the Atlanta Fed’s measure. 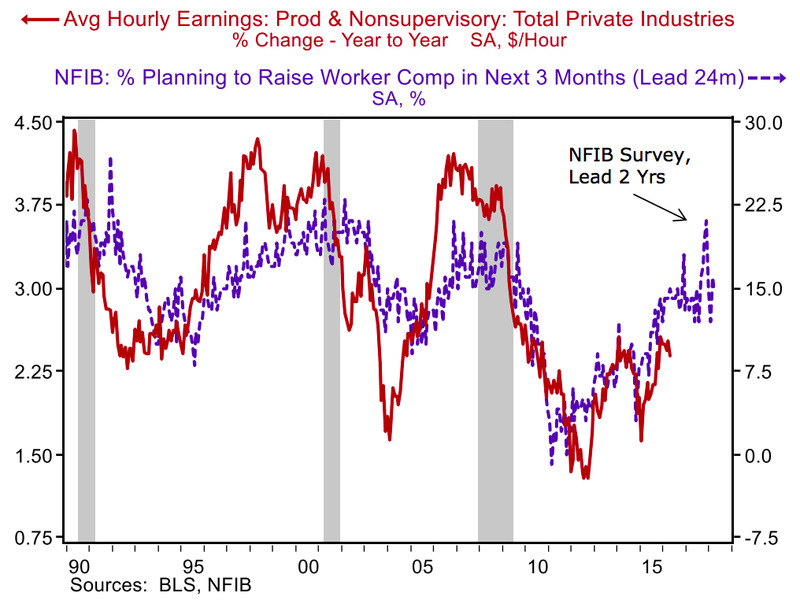 This latest wage indicator also comes after this morning’s NFIB Small Business Optimism report, which showed optimism in May ticked up slightly to 93.8. More significantly, however, the report showed the labour market continues to be squeezed. Tight. “Fifty-six per cent reported hiring or trying to hire (up 3 points), but 48 per cent reported few or no qualified applicants for the positions they were trying to fill,” the report said. And this updated chart, which comes to us from Jason DeSena Trennert at Strategas Research Partners, shows that everything small businesses are saying still points to higher wages. We’re just gonna have to be a little patient. ‘Any banker with a brain’ is now looking for an exit on Wall Street. Here’s what analysts had to say about Apple’s mediocre event. Inflation in Nigeria is out of control. IEX is getting closer to be awarded exchange status by the SEC. Henry Blodget’s vision for a better version of capitalism.